A member of the family of musical instruments called chordophones, the guitar is a stringed instrument with which sound is produced by “plucking” a series of strings running along the instrument’s body. While the strings are plucked with one hand, they are simultaneously fingered with the other hand against frets, which are metal strips located on the instrument’s neck. The sound of the vibrating strings is projected either acoustically, by means of the hollow chamber of the guitar (for an acoustic guitar), or through an electrical amplifier and a speaker. There are three main types of modern acoustic guitar: the classical guitar (nylon-string guitar), the steel-string acoustic guitar, and the archtop guitar, which is sometimes called a “jazz guitar”. 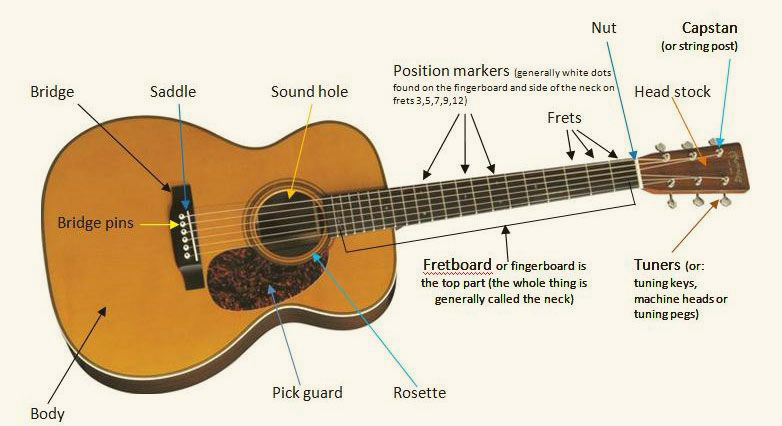 The tone of an acoustic guitar is produced by the strings’ vibration, amplified by the hollow body of the guitar, which acts as a resonating chamber. The classical guitar is often played as a solo instrument using a comprehensive finger-picking technique where each string is plucked individually by the player’s fingers, as opposed to being strummed. The term “finger-picking” can also refer to a specific tradition of folk, blues, bluegrass, and country guitar playing in the United States. The acoustic bass guitar is a low-pitched instrument that is one octave below a regular guitar. Electric Guitar A separate but closely related group of guitars is the electric guitar. It was introduced in the 1930s. It uses a device known as a pickup —a magnet surrounded by wire—to convert the energy from string vibrations into an electrical signal. The signal is sent to an amplifier, where it is boosted thousands of times. 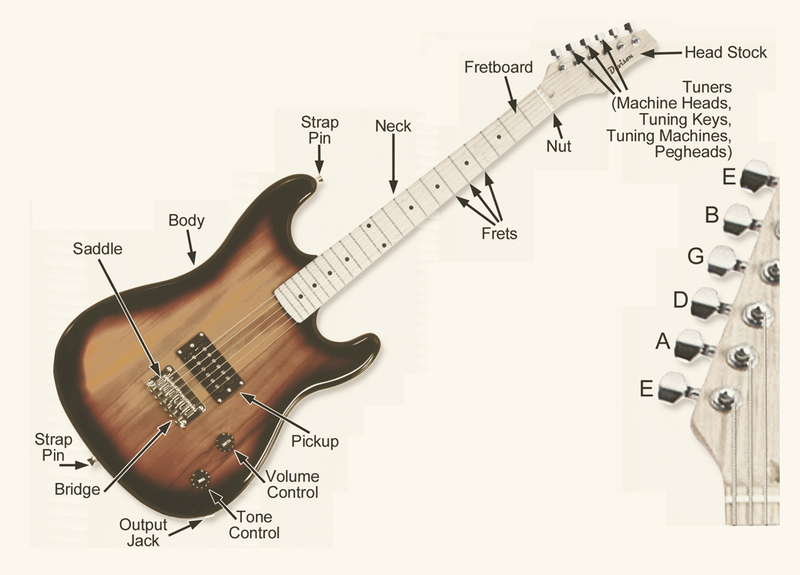 The body of an electric guitar has little impact on the quality of sound produced, as the amplifier controls both the quality and loudness of the sound. Acoustic guitars can also be fitted with electric pickups, and there are some models available today that already have the pickup built into the body. 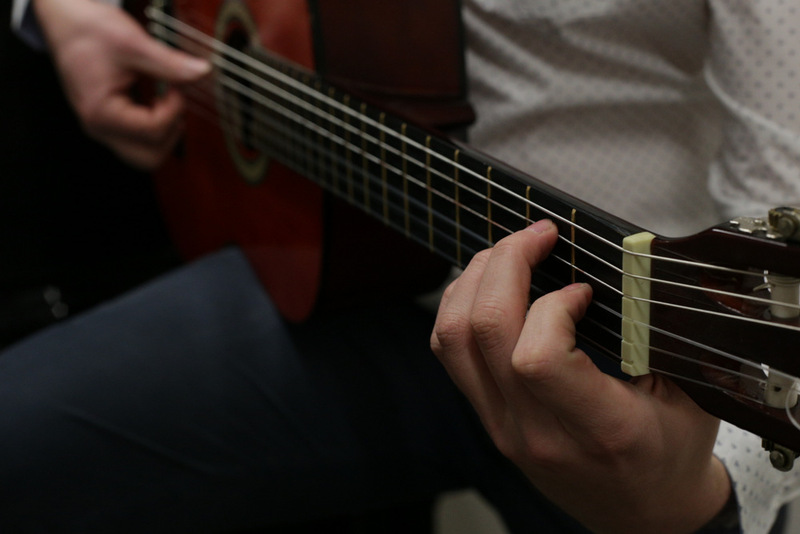 Find out more about our Guitar teachers here!